Welcome to Turbulence Training Day 24. Home fitness workouts that'll burn fat and sculpt your body in 4 weeks. 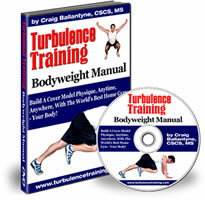 This is day 24 of Turbulence Training's Buff Dudes and Hot Chicks fat burning workout. "Hey there this is Asad from Better4Fitness.com, coming to you from Day 24 of the Buff Dudes and Hot Chicks workout. I absolutely smashed today's workout to pieces. I don't know whether it was frustration or anger within me, or... I don't know what it was! But I totally attacked the workout and I felt really good afterwards. It's got me buzzing now, as opposed to Monday where everything was hard, from the warm up to the cool down, but today it wasn't easy but I attacked, had loads of energy and I've come away from it really happy. I can actually see some really good improvements in my body. Around my stomach, I've dropped a belt size and I'm fitting into bottoms I never used to fit into before. Those kinds of things are really motivating me to keep going and push even harder. You can see my weekly progress with the photos. There's not really much difference from one week to the next, it's a gradual change but if you look from the 1st week to the 4th week or 8th week, you'll see a big difference. So you could say I'm on a motivational high today, I'm smiling I'm happy it's sunny! If you want to be smiling like this (cheesy grin) maybe not SO cheesy, but you know what I mean! Get to Better4Fitness.com and check out what I'm doing and I'll see you tomorrow take care... OH and here's today's exercise mash-up, enjoy."